British artist says colouring Taiwan differently from China was his "error"
The British artist Mark Wallinger has created a diplomatic problem by depicting Taiwan as an independent state in a prominent public artwork in central London. 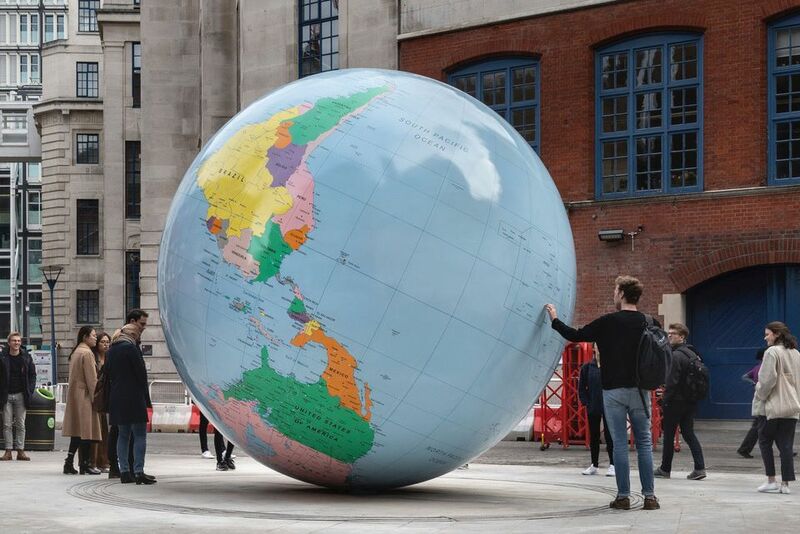 The work, entitled The World Turned Upside Down, is a 4-metre-diameter globe, which stands inverted on the north pole, set on the street outside the entrance to the London School of Economics (LSE). The globe shows the island of Taiwan (which calls itself the Republic of China) as a sovereign entity, rather than as part of the People’s Republic of China. The United Nations and virtually all its members, including the UK, do not recognise Taiwan as a separate sovereign state. Wallinger has also marked Lhasa, in Tibet, as a national capital, although Beijing alone is recognised as having this status. When the work was unveiled on 26 March, Wallinger said that “the UN is the authority as to the names and borders”, whereas his own globe represents “the world, as we know it from a different viewpoint; familiar, strange and subject to change”. It might therefore be thought that the artist was being deliberately provocative in giving Taiwan and Tibet their independence. However, Wallinger tells The Art Newspaper that these two changes to what is recognised by the UN had been “an error”. Giving Taiwan independent status on Wallinger’s globe has angered mainland Chinese students at LSE and could even discourage donors and sponsors from the People’s Republic. The LSE director, Minouche Shafik, may now be regretting what she said at the unveiling: “This bold new work by Mark Wallinger encapsulates what LSE is all about." Whether Wallinger’s globe is to be changed will depend on LSE’s decision, but any alterations would almost certainly also require the artist’s approval. Wallinger says that he feels it is up to LSE to advise on what would be appropriate and he now has “an open mind” on any changes.